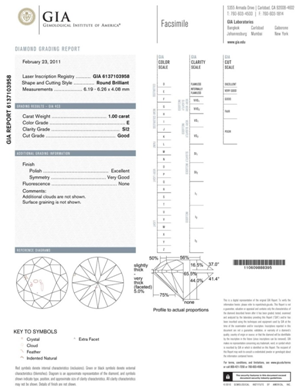 A diamond certificate (also known as a diamond grading report), is your proof the diamond has been examined in detail by a professional gemmologist. A certificate will detail a number of characteristics about the diamond, including its dimensions, carat, weight, colour and clarity. At Angelic Diamonds all our GIA diamonds of 0.30 carat and over and SDC of 0.50 carat and over are independently certified by completely independent labs. It is very important when buying a diamond over 0.50 carat that you ensure the diamond comes with an independent certificate. 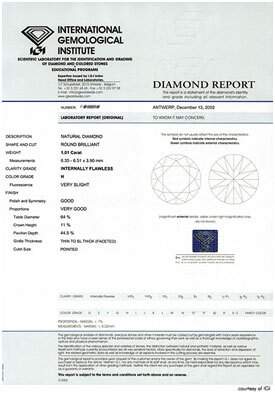 This shows the diamond has been graded by an unbiased and professional examination. All too often we see diamonds being sold in high street shops and online stores that do not come with independent certificates. Diamonds that have not been independently certified are often graded higher than they actually are, as the retailer has an interest in providing a higher grade and therefore increasing the value of the diamond. Independent diamond certificates on diamonds over 0.50 carat are essential in determining a diamonds value. GIA Diamonds under 0.30 carat and SDC under 0.50 carat are not certified by independent laboratories and therefore will come with our own certificate. This is standard practice. What independent laboratories do we use? 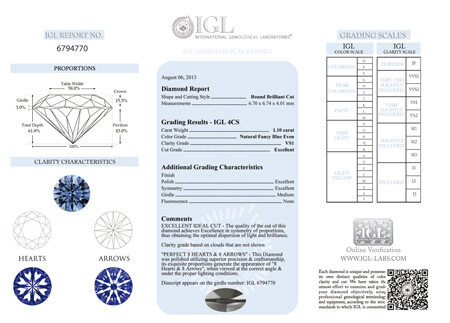 We use a number of independent labs for our SDC certified diamonds including but not limited to WGI (World Gemological Institute), IGL (International Gemological Laboratories) and IGR (International Gemological Reports). We also offer GIA (Gemological Institute of America) certified diamonds. GIA labs are widely recognised to the most prestigious and respected independent laboratories in the world. It must be noted not all laboratories are as strict as GIA. It is generally accepted by professionals in the jewellery industry that GIA set the standard when it comes to diamond grading. This is why GIA certified diamonds tend to be sold at a higher price than others. Below are some examples of the different independent certificates.